For more than 130 years, Coney Island has been host to a number of imaginative amusements. Here we take a look at the amusement rides – some long gone, some still standing. Horse racing had been a popular pastime at Coney Island since its emergence as a resort area in the 1840s . When George C. Tilyou opened Steeplechase Park in 1895, he presented his customers with the steeplechase ride. People rode side-by-side on mechanical horses down a track of over 1,000 feet, simulating a horse race. 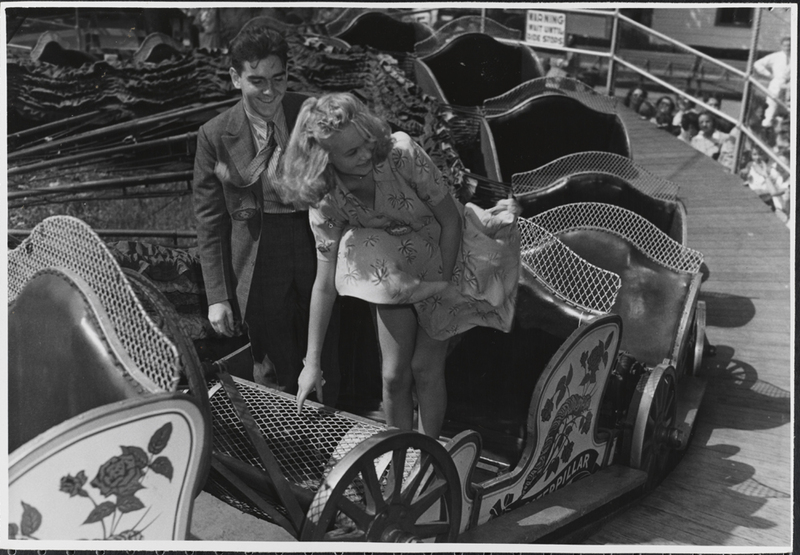 Around 1907 Luna Park introduced The Tickler, in which people in rotating cars were jostled down a curved path. Construction of the Wonder Wheel began in 1918 on-site and was completed in 1920. Unlike other Ferris wheels of the time, not all of the cars on the Wonder Wheel were stationary. 16 of the 24 cars rolled back and forth on curved tracks between the inner and outer wheels. The Wonder Wheel remains in operation and is still a popular attraction to this day. The New York City Landmarks Preservation Commission designated it a landmark in 1989. The caterpillar ride debuted at Steeplechase Park in 1925. 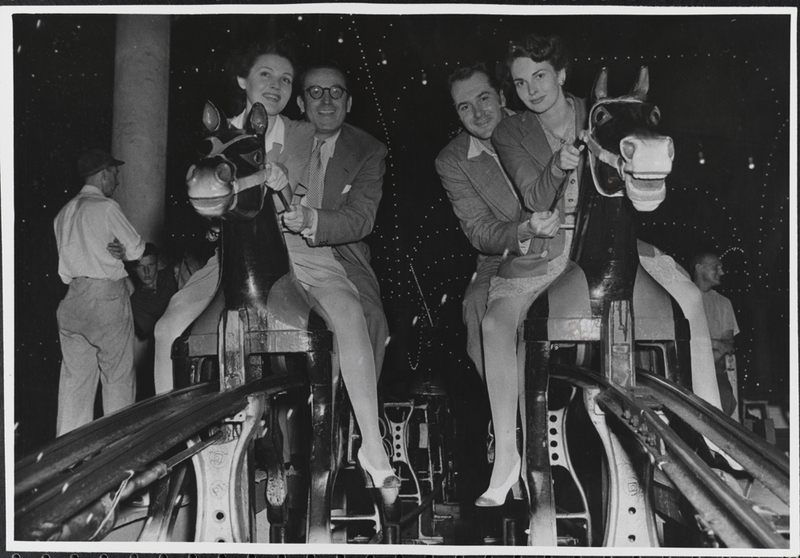 The ride featured a canopy that enclosed cars once it reached maximum speed, making it popular with couples. It also contained a large fan that blew air from the seats. The Cyclone opened in 1927 and still runs today. 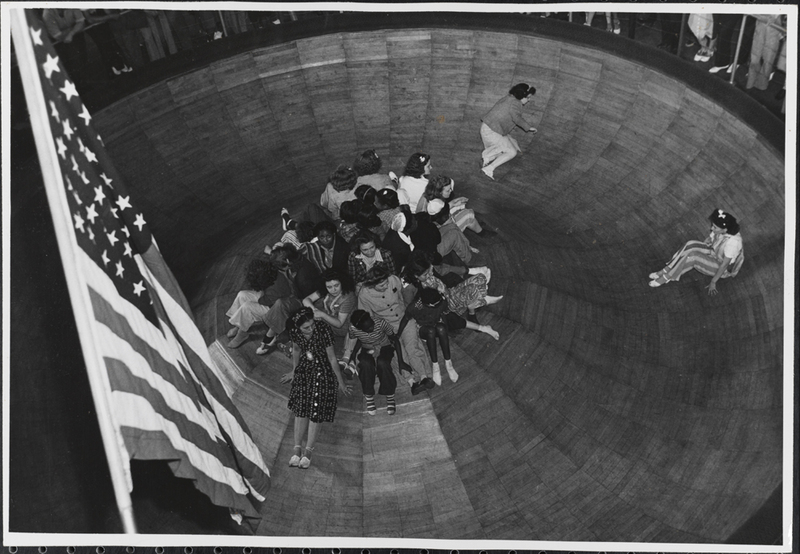 In 1988, the Landmarks Preservation Commission declared The Cyclone a landmark. It was also placed on the National Register of Historic Places in 1991. 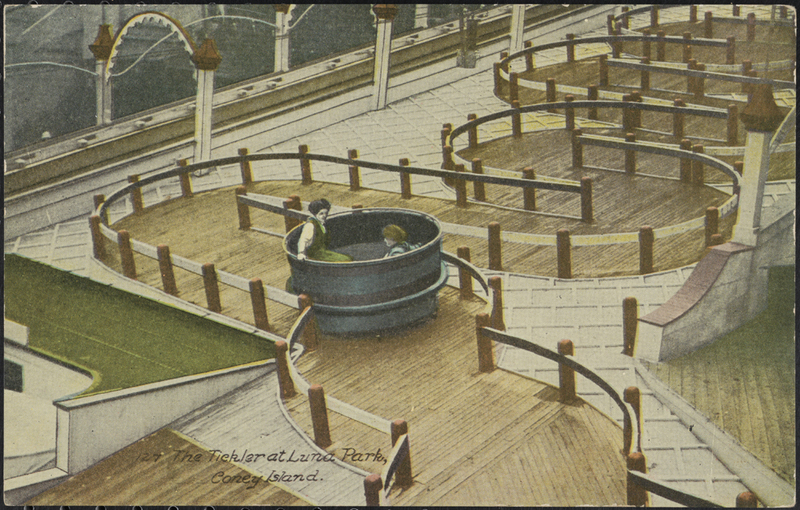 This spinning disk at Steeplechase Park’s Pavilion of Fun rotated faster and faster until everybody in the center had been flung to the side. 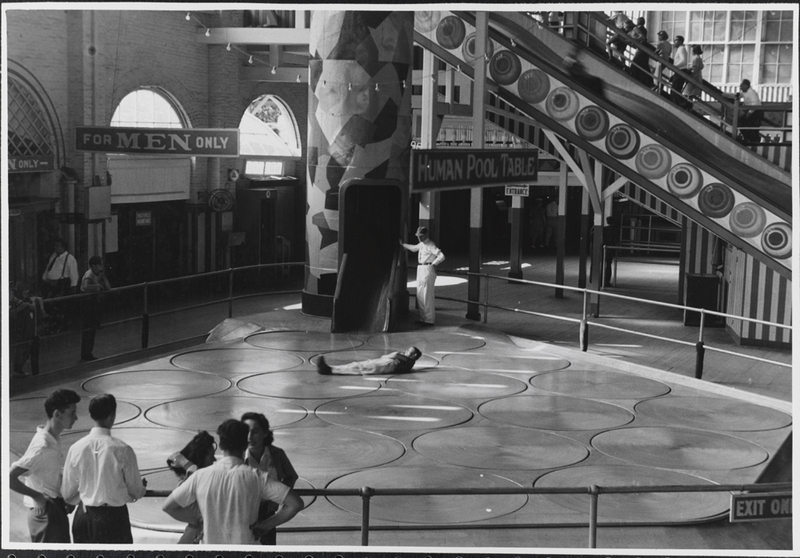 The Pavilion of Fun also housed The Human Pool Table, which featured a series of spinning discs for the rider to navigate. The objective was to move from one side to the other without being seriously diverted. The Parachute Jump was built for the 1939 World Fair by a retired Navy officer, Lieutenant Commander James Hale Strong. After the fair, the Tilyou family purchased the tower and moved it to Steeplechase Park in 1941. The Parachute Jump ceased operation on September 19, 1964 after the closure of Steeplechase Park (see http://www.coneyislandhistory.org/mrconey/?p=8 for more details.) It is the only remaining structure of the amusement park, which was demolished in 1966. In 1980 the Parachute Jump was placed on the National Register of Historic Places. Nine years later, New York City identified it as a landmark. Every effort has been made by the author to identify Tilgins, the only name associated with some of the content used in this blog entry. If you can help us identify Tilgins, please contact the museum at collections@mcny.org. 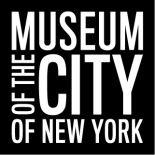 The photographs by Tilgins are part of the Reginald Marsh collection at the museum. Digitization of this collection was made possible by funding from the National Endowment for the Arts. There are two great books out there that detail the social and cultural history of Coney Island: John Kasson’s Amusing the Million and Kathy Peiss’s Cheap Amusements are both excellent sources. Both tell a fascinating story about how leisure and amusement became a thing bought and sold. Coney Island was at the forefront of this change! Great blog, especially for someone who grew up near Coney Island and in the shadow of all the rides. Interesting! I imagine someone out there will be able to help you identify the photographer Tilgins. This entry was posted on October 4, 2011 by Lauren Robinson in Digital Project, Photo Archive, Postcard Collection and tagged Amusement parks, Coney Island, Cyclone, ferris wheels, Human Pool Table, Luna Park, Parachute Jump, rides, rollercoasters, steeplechase, Steeplechase Park, Tickler, Wonder Wheel.